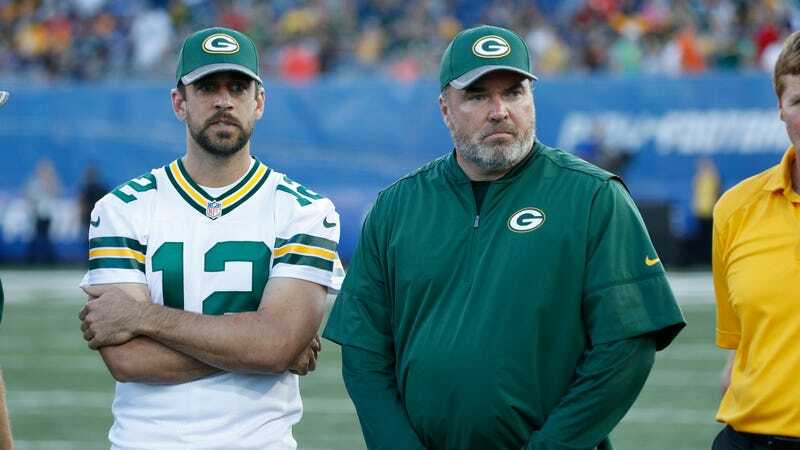 It’s no secret that Packers quarterback Aaron Rodgers and former Packers head coach Mike McCarthy did not get along during their 13 seasons together in Green Bay, but it’s always great when we get a new batch of details showing just how wide and deep the rift between the two really was. Bleacher Report’s Tyler Dunne published today a deeply reported accounting of how Rodgers and McCarthy both managed to undermine what should have been a much more successful era of Packers football, and it contains some tremendous details about Rodgers being a vindictive weenie and McCarthy being a guy whose abilities didn’t match his ego. The overall thesis of the story, which is based on interviews with players, coaches, and personnel men who spent time in Green Bay, is that Rodgers and McCarthy are equally responsible for the Packers repeatedly falling short of the success they should have achieved. Rodgers catches blame for being a toxic presence in the locker room who forced his teammates to choose sides in his cold war against McCarthy, and McCarthy gets dinged for thinking too highly of his own abilities and failing to adapt his system to suit Rodgers. According to one of Dunne’s sources, McCarthy’s play-calling was so bad that last season Rodgers changed a third of the plays in the huddle. The problem was that McCarthy kept calling the same plays he’d called for the 15-1 2011 Packers team despite the personnel being totally different. As Dunne puts it, McCarthy believed that it was his system that had brought the team so much success, and that it would work whether Rodgers was throwing to studs like Jordy Nelson and Greg Jennings or an assortment of unproven rookies. A source close to the team says [Equanimeous] St. Brown became frustrated because as much as he wanted to follow McCarthy’s play design, he also heard rumors of Rodgers freezing out teammates if they didn’t do exactly what he demanded. So he listened to Rodgers. On one play in New England, Rodgers told St. Brown to run a post route when the play called for a flag. St. Brown ran the post, and pressure forced Rodgers to throw the ball away toward the flag—leading his position coach to grill him on what he was thinking. There’s a lot more in Dunne’s story, which is tremendous reading for anyone who enjoyed watching the strange and protracted unraveling of the Rodgers-McCarthy Packers. For Packers fans, it will be a cruel reminder that this team probably could have won three or four more Super Bowls if not for Rodgers and McCarthy’s feuding.